The sixth and final season of the American teen drama television series Gossip Girl premiered on The CW on October 8 and concluded on December 17, 2012, consisting of 10 episodes. Based on the novel series of the same name by Cecily von Ziegesar, the series was developed for television by Josh Schwartz and Stephanie Savage. The CW officially renewed the series for a sixth season on May 11, 2012. The series finale was preceded by a special retrospective, including interviews with the cast and crew. The summer is over and Serena has gone missing. After a brief encounter abroad, Blair and Chuck make a promise to each other about their relationship, which leaves them once again apart. Dan, with some help from an unlikely ally, Georgina, is writing a scathing tell-all book that can only mean trouble. As the sole head of The Spectator, Nate is making his own decisions and is ready to go up against Gossip Girl. As word spreads that Serena is missing, the gang bands together to find her and are shocked by what they find. Title reference: The 2007 film Gone Baby Gone. Trying to prove herself in adult society, Serena hosts the Central Park Conservancy's big gala, of which she is now the newest board member, and she and Nate both learn something shocking about their significant others. Blair prepares to debut her new fashion line, but a rival from her past holds the key to her future. With the help of Georgina, Dan lands some meetings with publishers, but he must decide if he is willing to sacrifice his integrity in order to get his work published. Meanwhile, Chuck tries to persuade Amira to help him look into his father's past, even if it means jeopardizing Lily and Bart's relationship. Title reference: The 2000 film High Fidelity. Title reference: The 1988 film Dirty Rotten Scoundrels. Chuck's continued investigation into his father's dealings leads him to an unlikely event with Manhattan's elite, where he hopes to find the one person who can tell him the truth about Bart. Serena and Steven decide to reveal their romantic histories so they are not surprised about anything, but neither was prepared for what they uncovered. With The Spectator in jeopardy after Dan decided to publish elsewhere, Nate must make a difficult decision to keep it in business. Meanwhile, Georgina pushes Dan to choose a worthy person to date to boost his image, but he finds himself drawn in a different direction. Elsewhere, Ivy tries to persuade Rufus to go through and unpack a group of boxes with all of his stuff from the apartment that Lily had sent over to the loft after he moved out. Title reference: The 1996 film The Portrait of a Lady. After Eleanor gives Blair an ultimatum, Blair is even more determined to remedy Waldorf Designs' problems by making a splash with a dress at the upcoming cotillion, but a shocking revelation at the ball affects everyone. Serena becomes worried about Steven's attitude toward her, but after some investigating she discovers the surprising reason why. Sage learns that her father plans to propose marriage to Serena and plots an all-out attack to destroy the engagement once and for all despite the risk of endangering her relationship with Nate. Chuck finds an unlikely ally in Ivy as he tries to drive a wedge between Bart and Lily's relationship to help expose his father's secret. Meanwhile, Dan publishes another article, but the effect is just the opposite of what he was hoping for as Georgina continues to pressure him to publish more. Elsewhere, Rufus learns about Ivy's inheritance as she continues to help him rebuild his life. Title reference: The 2001 film Monster's Ball. Blair gets ready for her mother's imminent arrival, but is unprepared for the set of demands her mother puts upon her. Serena volunteers to help Dan find a new place to live, but their time together brings up unexpected emotions. With Ivy's help, Chuck discovers there is evidence incriminating his father in illegal activities and enlists the help of Nate to retrieve it. Meanwhile, Rufus and Ivy are excited about their art gallery opening until they find an empty RSVP list and must scramble to find another way to make the event a success. Title reference: The 2009 film Where the Wild Things Are. Serena and Dan realize that they need to make amends with the people they have wronged to rebuild their shattered lives. Blair has one last chance to prove to her mother her worth as a fashion designer and with Serena's help, comes up with a plan to make her line the "it" look for Sage and her friends. Chuck is close to getting the evidence he needs against his father, until one of his closest allies reveals his plan to Bart. Title reference: The 2001 film Save the Last Dance. Serena and Dan decide to throw their first Thanksgiving dinner together, inviting only their closest friends, but everyone seems to have their own agenda for attending. Serena has a run-in and invites both Steven and Sage to the dinner, while Lily and Bart also crash the event which fuels the tension between everyone. Feeling defeated by his father, Chuck begins a downward spiral, leaving Blair to find a solution to his problems. Meanwhile, Dan has written his latest exposé, but he must make a tough decision whether to publish it, knowing it could destroy a close friendship with Serena and everyone else that he knows. Title reference: The 2009 film It's Complicated. After a run-in with an increasingly paranoid Bart, Blair grows alarmingly concerned for Chuck's safety. Feeling confident that his father will never hurt him, Chuck makes a deal that could change his life. Blair devises a plan with the help of Serena, Georgina, Sage and Ivy to get what they need out of Bart. Meanwhile, Nate's financial dilemma lands him in a place that he never thought he would be, jail. In the end, Chuck is escorted by Bart's security to the roof of a building, minutes later Bart joins him. Blair, alarmed at not being able to locate Chuck, asks around for him and races up to the roof as well. A fight ensues between Chuck and Bart and Blair arrives just in time to see Bart hanging off the side of the building. Chuck refuses to help him up for fear that he would harm his friends or himself. The episode ends with Bart falling and Blair and Chuck running off. Title reference: The 2012 film The Avengers. Serena decides to come back to New York and confront Dan about the "Serena Chapter". Chuck proposes to Blair when he is implicated in the death of Bart. Georgina joins forces with Jack Bass in one last scheme to help Chuck and Blair. Nate and Sage try to find the identity of Gossip Girl with the information that they have. William van der Woodsen returns to comfort Lily and rejects Ivy who finally realizes that William used her just to win Lily back. Dorota, Eleanor Waldorf and Cyrus Rose also become involved in planning Chuck and Blair's improvised wedding. Various characters from previous seasons make cameos, including Vanessa, Juliet, Agnes and Lola. Kristen Bell has a cameo as herself alongside Rachel Bilson. Dan is revealed to be Gossip Girl. Five years later: The group gathers for Dan and Serena's wedding. Eric and Jenny are both in attendance as is Eleanor and Cyrus Rose who is delivering the vows. Nate has become successful with The Spectator and will likely run for Mayor of New York City. Chuck and Blair are still married and have a four-year-old son named Henry Bass. Ivy has written a best-selling autobiography titled Ivy League which has been adapted into a major Hollywood feature film with her as the screenwriter and starring Olivia Burke and Lola Rhodes as the Serena and Ivy/Charlie characters. Georgina and Jack have gotten together, Lily and William are finally back together and Rufus is with Lisa Loeb. In the final shot, a new generation of wealthy Upper East Siders are seen at Constance as a new lonely boy walks past his classmates, denoting the beginning of a brand-new Gossip Girl. Title reference: The 2009 film New York, I Love You and Torrance. On May 11, 2012, the series was picked up for a short sixth and final season, beginning in October and concluding on December 17. On May 17, 2012, with the reveal of The CW's 2012–13 television schedule, Gossip Girl stayed on Monday night and moved to the 9:00 pm Eastern/8:00 pm Central timeslot following the fifth season of 90210. It was announced on July 30, 2012, that the sixth season would have 10 episodes. On April 25, 2012, it was confirmed that former showrunner and executive producer Joshua Safran left the show as he had become the new showrunner of NBC's Smash. On May 11, 2012, writer Sara Goodman was promoted to executive producer. On October 29, the fourth episode of the season, "Portrait of a Lady Alexander", was rescheduled for November 5, due to Hurricane Sandy. Blake Lively, Leighton Meester, Penn Badgley, Chace Crawford, Ed Westwick, Kaylee DeFer, Kelly Rutherford, and Matthew Settle all returned as series regulars. Michelle Trachtenberg was upgraded to a guest-starring role for this season. Former recurring star, Desmond Harrington and Robert John Burke, also returned as guest stars for the season. On July 7, 2012, actress Andrea Gabriel, known for her role on Lost, had been cast as a businesswoman from Dubai. 7th Heaven alum Barry Watson landed a guest-starring role as young entrepreneur Steven Spence, who becomes romantically involved with Serena. British model Alexa Chung appears as herself in a plot involving Blair's new fashion line. Former Skins star Sofia Black D'Elia was seen filming scenes with Lively for the then-upcoming sixth season. She played the role of Sage Spence, Steven's daughter. Former Gossip Girl guest stars Tamara Feldman and Yin Chang were reported to return to the show for its final season as Poppy Lifton and Nelly Yuki, respectively. Taylor Momsen and Connor Paolo reprised their roles as Jenny Humphrey and Eric van der Woodsen for the series finale, who had not been seen since their departures in season 4. Ben Affleck, Matt Damon, Brad Pitt, Casey Affleck, Scott Caan, Elliott Gould, in Ocean's Trilogy and Torrance has cameo roles in the film and Kristen Bell, Rachel Bilson, Katie Cassidy, Ella Rae Peck, Willa Holland, Lisa Loeb, Michael Bloomberg and Jessica Szohr had cameo roles in the series finale. ^ a b c Ausiello, Michael (May 11, 2012). "Gossip Girl Renewed For Shortened Final Season, Sara Goodman to Succeed Josh Safran as EP". TVLine. Retrieved June 26, 2012. 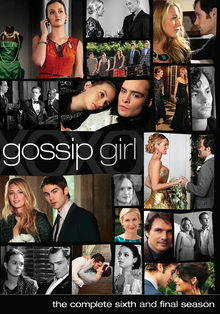 ^ a b "Gossip Girl Wraps Up a Six-Season Run with a Two-Hour Series Finale on Monday, December 17". The CW. November 1, 2012. Archived from the original on November 9, 2012. Retrieved March 23, 2017. ^ a b c Kondolojy, Amanda (October 9, 2012). "Monday Final Ratings: 'The Voice', 'DWTS' Adjusted Up; '90210′, 'Revolution', 'Partners', '2 Broke Girls', 'Mike & Molly', 'Hawaii Five-0′, and 'How I Met Your Mother' Adjusted Down". TV by the Numbers. Archived from the original on October 11, 2012. Retrieved October 10, 2012. ^ a b c Bibel, Sara (October 16, 2012). "Monday Final Ratings: '2 Broke Girls', 'Hawaii Five-0' Adjusted Up; 'Revolution' Adjusted Down Plus Final Baseball Numbers". TV by the Numbers. Archived from the original on October 18, 2012. Retrieved October 17, 2012. ^ a b c Kondolojy, Amanda (October 23, 2012). "Monday Final Ratings: 'The Voice' & MLB Baseball Adjusted up; No Adjustment for '90210' or 'Dancing With the Stars' + Final Debate Analysis Numbers". TV by the Numbers. Archived from the original on October 26, 2012. Retrieved October 24, 2012. ^ a b c Kondolojy, Amanda (November 6, 2012). "Monday Final Ratings: '2 Broke Girls', & 'Revolution' Adjusted Down; No Adjustment for 'The Mob Doctor', '90210' or 'The Voice'". TV by the Numbers. Retrieved November 6, 2012. ^ a b c Bibel, Sara. "Monday Final Ratings: 'The Voice' & 'Hawaii Five-0' Adjusted Up; 'Castle', 'Dancing With the Stars' & 'The Mob Doctor' Adjusted Down". TV by the Numbers. Retrieved November 13, 2012. ^ a b c Kondolojy, Amanda (November 20, 2012). "Monday Final Ratings: 'Dancing With the Stars' & 'Gossip Girl' Adjusted Up; 'How I Met Your Mother' Adjusted Down". TV by the Numbers. Retrieved November 20, 2012. ^ a b c Kondolojy, Amanda (December 4, 2012). "Monday Final Ratings: 'How I Met Your Mother' & 'Hawaii Five-0' Adjusted Up; 'Extreme Makeover', 'Gossip Girl' & 'Blake Shelton's Not So Family Christmas' Adjusted Down". TV by the Numbers. Retrieved December 4, 2012. ^ a b c Kondolojy, Amanda (December 18, 2012). "Monday Final Ratings: 'The Voice' Adjusted Up; '1600 Penn' Adjusted Down + No Adjustments for 'Gossip Girl' Finale". TV by the Numbers. Retrieved December 18, 2012. ^ Ausiello, Michael (May 17, 2012). "CW Boss on the Demise of Ringer, a Supernatural End Date, Gossip Girl Episode Count and More!". TVLine. Retrieved June 26, 2012. ^ a b Gorman, Bill (May 17, 2012). "CW 2011-12 Primetime Schedule: 'Supernatural' To Wednesday, 'Nikita' To 9pm, 'Beauty & The Beast' Follows 'Vampire Diaries' & Lots More Changes". TV by the Numbers. Retrieved May 17, 2012. ^ Guthrie, Marissa (July 30, 2012). "TCA 2012: CW's Mark Pedowitz Talks 'Gossip Girl,' 'Muppets' and Flaws in Nielsen Measurement". The Hollywood Reporter. Retrieved August 1, 2012. ^ Richenthal, Matt (April 25, 2012). "Gossip Girl Executive Producer to Run Smash". TV Fanatic. Retrieved June 26, 2012. ^ "Hurricane Sandy derails CW and CBS: Gossip Girl Hawaii Five-O Partners and more to air repeats instead of new episodes". zap2it.com. October 29, 2012. Retrieved October 30, 2012. ^ Gennis, Sadie (July 7, 2012). "Lost Alum Andrea Gabriel Joins Gossip Girl". TV Guide. Retrieved August 12, 2012. ^ Corneau, Allison (July 10, 2012). "Barry Watson joins Gossip Girl's Final Season". Us Weekly. Retrieved August 12, 2012. ^ MacKenzie, Carina Adly (August 2, 2012). "Gossip Girl snags Alexa Chung for final season". Zap2it. Archived from the original on August 4, 2012. Retrieved August 12, 2012. ^ Douglass, Beth (August 3, 2012). "Gossip Girl Season 6: Serena Spotted With The New Girl-and She's a Troublemaker!". Wetpaint. Retrieved August 12, 2012. ^ MacKenzie, Carina Adly (August 15, 2012). "Gossip Girl Season 6 spoilers: Nelly yuki and Poppy Lifton return". Zap2it. Archived from the original on August 17, 2012. Retrieved August 16, 2012. ^ Mullins, Jenna (October 16, 2012). "Gossip Girl scoop Taylor Momsen and Connor Paolo twitpic teases wedding or maybe it doesn't". Zap2it. Retrieved October 16, 2012. ^ Bricker, Tierney (November 9, 2012). "Kristen Bell to (Finally!) Appear in Gossip Girl Series Finale". E! Online. Retrieved March 23, 2017. ^ Gonzalez, Sandra (October 12, 2012). "'Gossip Girl' scoop: Katie Cassidy returning for the finale!". Entertainment Weekly. Retrieved February 12, 2018. This page was last edited on 17 March 2019, at 22:22 (UTC).